What is Proactive Safety Management? Proactive safety management is usually held as the highest form of risk management. This is because being able to demonstrate proactive safety management activities usually happens when an SMS program is well into implementation. However, safety management activities that are proactive are neither better nor worse than other types of safety management - they simply have different safety goals. Understand what behaviors and attitudes are influencing safety performance. There’s no reason that aviation SMS programs in early phases of implementation can’t adopt some proactive management strategies. Proactive activities for managing safety will become easier as the program matures. It’s important to remember that proactive risk management is not simply a concept or “better” version of reactive risk management. Proactive risk management is defined by specific activities and with specific goals that are different than reactive risk management. Both reactive and proactive risk management complement each other, and are both an essential over safety management strategy. Uncovering precursors to risk, such as the relationship between a hazard, a threat, and a risk. Like reactive safety management, proactive safety management of risk is the responsibility of all employees, and not just safety management. 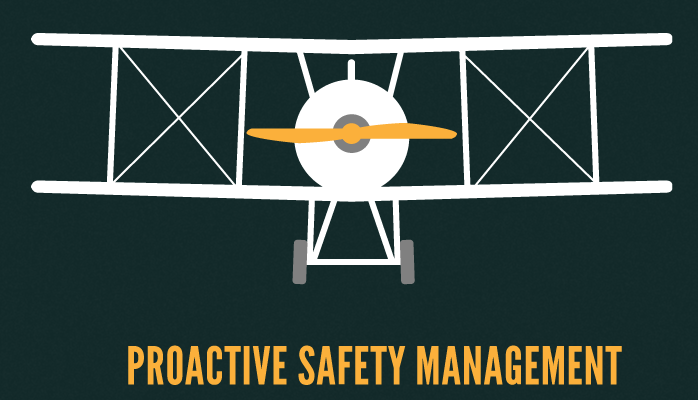 Each level of an organization has specific proactive behaviors that create proactive safety culture in an aviation SMS program. All of these activities involve addressing safety before safety becomes a concern. A good rule of thumb for proactive safety management activities are: address "concerns about safety" before they become "safety concerns."